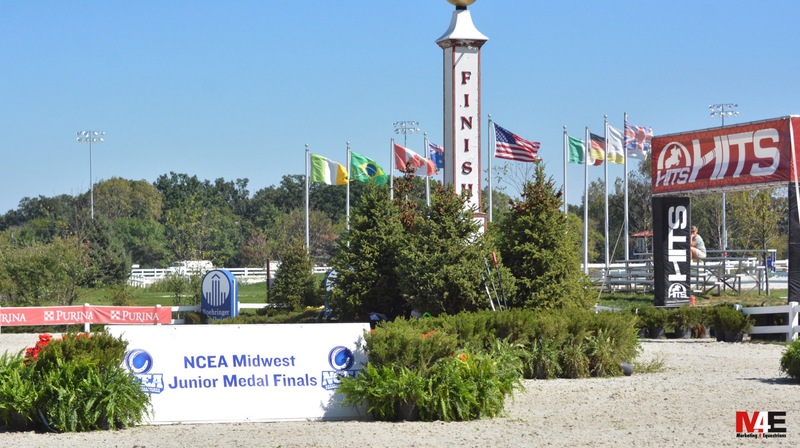 HITS and Showplace Productions hosted the 2018 NCEA Midwest Junior Medal Finals which were included on the livestream at showhorsetv.com. 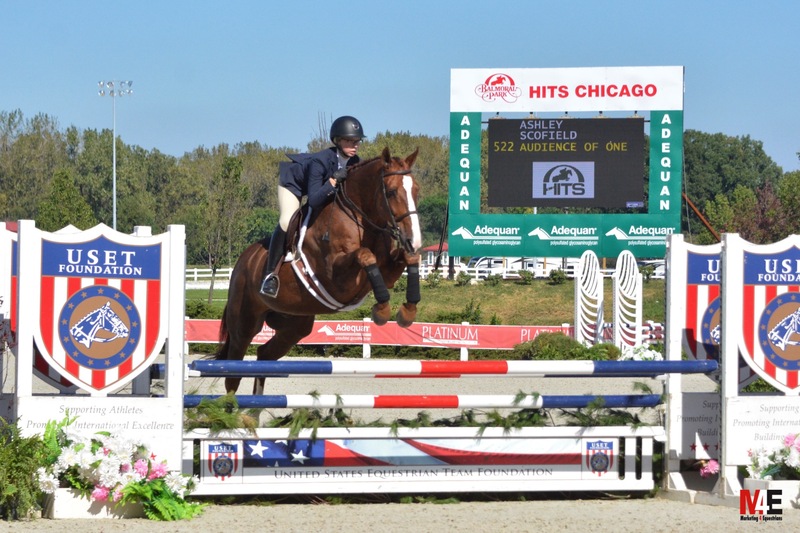 Crete, IL – September 15, 2018 – HITS and Showplace Productions chalked up another day of championships at the Showplace Fall Classic at Balmoral Park, featuring the NCEA Midwest Junior Medal Finals, which drew crowds to the stands and created excitement among riders and trainers. 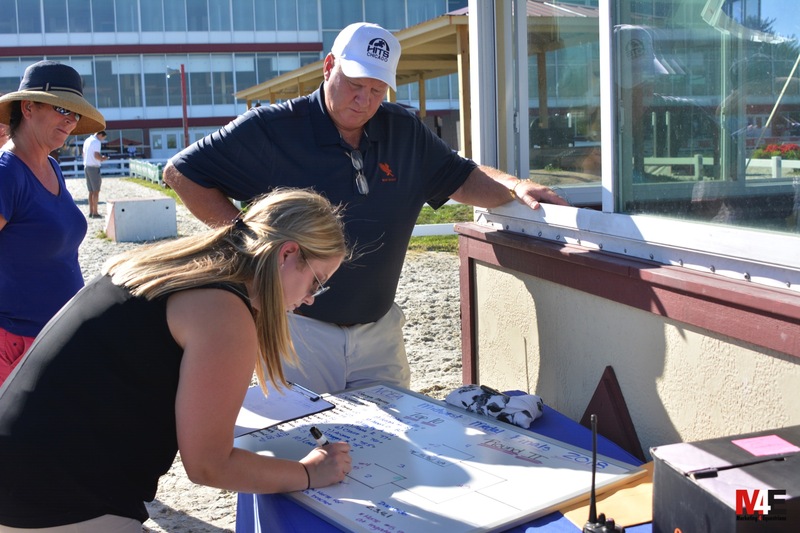 Show manager Patrick Boyle decked out the grand prix ring in traditional Showplace style to allow riders to demonstrate their skills to judges Sarah Booker, Columbia, Missouri, and Sue Ashe of Wellington, Florida. The format is similar to the NCAA format where the top 10 scoring riders after the first round of over fences are invited back for a flat phase. Each rider is given a flat score, which is added to the first round score, revealing the top four riders. Over a second course, the top riders begin to ride other horses based on a predetermined draw, to determine the top two riders, who then go head to head to establish the overall winner. 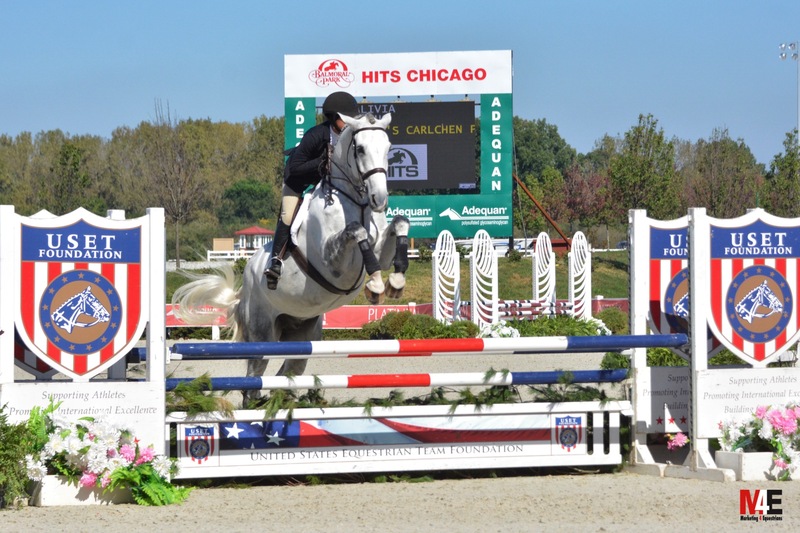 In the final round, Alex Ortiz of Chicago, and Ashley Scofield, Oswego, Illinois, both were fortunate to ride the beautiful Cristallo’s Carlchen P, owned by Alivia Kohus. Scofield went first scoring an 83 but Ortiz knocked it out of the park scoring an 88 for the win. Ortiz rides with Janet and Ryan Sassmannshausen at Kinvarra Farm in St. Charles, Illinois. The winner received a One-K Helmet, a pair of Eq-Teq Front Boots and a pair of F.LLI FABBRI paddock boots. Alexis Ortis knocked it out of the park in the final round of the NCEA Midwest Junior Medal Finals for the win, pictured with trainer Ryan Sassmannshousen and Patrick Boyle. Rounding out the final four were Georgia Murray taking the third place spot and Alivia Kohus, who took home fourth. “The NCEA class was a good experience and a good kind of pressure for the kids. It is officially becoming one of my favorite classes. First, it’s geared toward education and scholarships and second, it has over fences, flat and acknowledges the top 10. With the brackets, top 4, then top 2, where you are switching horses, the kids have to ride and rise up to the occasion. I think it’s a great class and I hope there are more of them, I think it sets my riders up for regionals and finals in a way the other local finals don’t. You can’t create that kind of pressure anywhere else. Back and forth in that last bracket was pretty close. The crowd really participated more than regular classes too; they seemed to really get into it cheering for the riders. The organization videos the class and sends it out to colleges - how great for the kids to be highlighted to recruiters. Pat Boyle and staff Lexi Bowan organize the brackets as the judges call in the scores for the NCEA Medal. Pat Boyle sits on the National Advisory Board, which is committed to elevating and advancing equestrian to the most sustainable and strongest of all NCAA women’s sports. 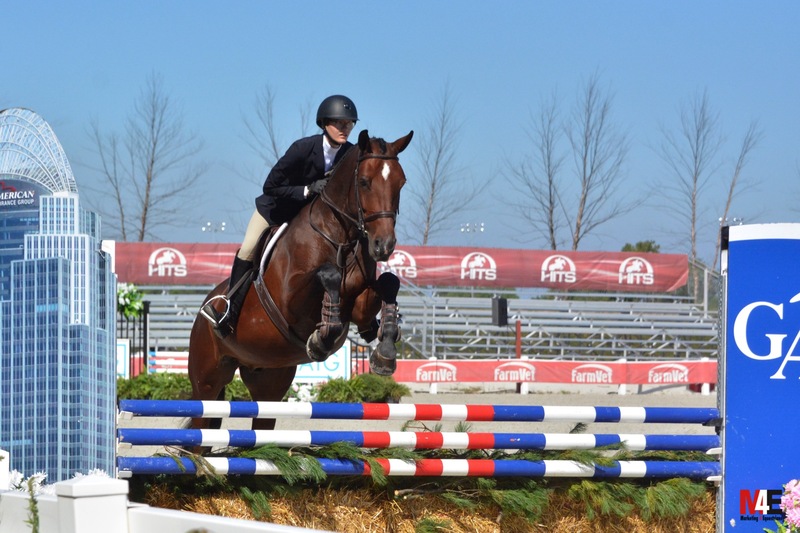 The NCAA currently recognizes 24 colleges and universities with equestrian programs and is working with to expand the program to additional academic institutions with a goal of 49 colleges. 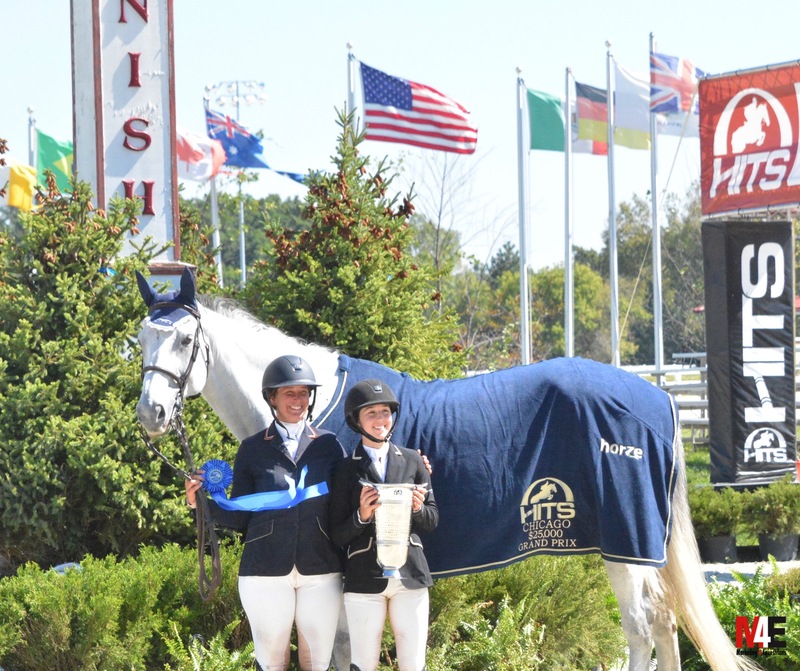 Lisa Goldman with student Adeline Rohrbach accept Hindsight's award for his HITS Grand Prix victory. This week’s $25,000 HITS Grand Prix winner, Lisa Goldman, rode on the Baylor Equestrian team and in 2012, Goldman helped secure Baylor’s only Equestrian National Championship to date. Goldman has turned into a grand prix sensation since graduating, earning over $2.5 million in jumper prize money and stands in the top 25 on the ranking list. She rode her Hindsight to the win and took second on Barbara Disko's Sovereign. 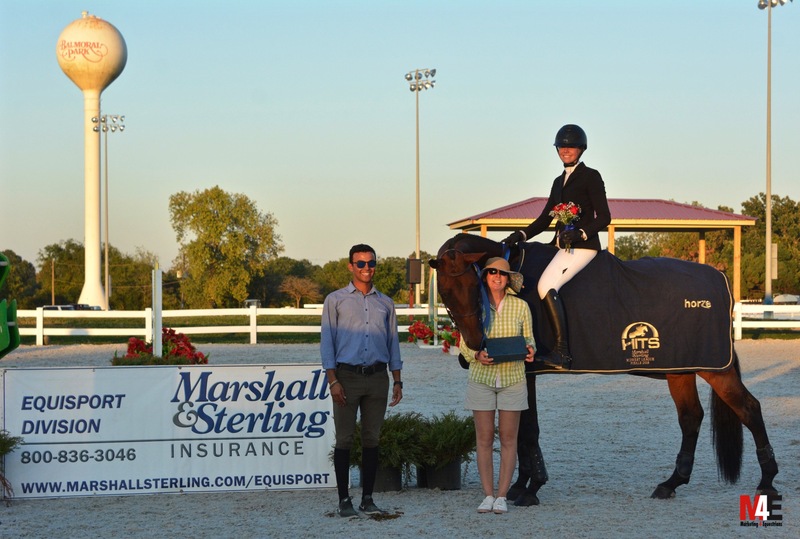 Shannon Sullivan placed third with Downtown's Main Event and Adeline Rohrbach rounded out the top four with Valladam in an exciting jump off. "It’s a great competition because riders compete in their brackets on the same horse so it’s really a test of who rode that horse the best. It’s a really fair way to judge a rider’s skill. They didn’t have this when I was trying to get into college; it’s a great class." Paige Matthies heads to the winner's circle again with trainers Melissa Hirt and Gabriel Rodrigues for her win in the M&S Junior/Amateur Horsemanship Final. Other big winners included Paige Matthies, who won the Marshall & Sterling (M&S) Junior/Amateur Horsemanship Final, training with Melissa Hirt of Northern Pines Farm. (Matthies also won the M&S Junior Medal Final earlier in the week.) 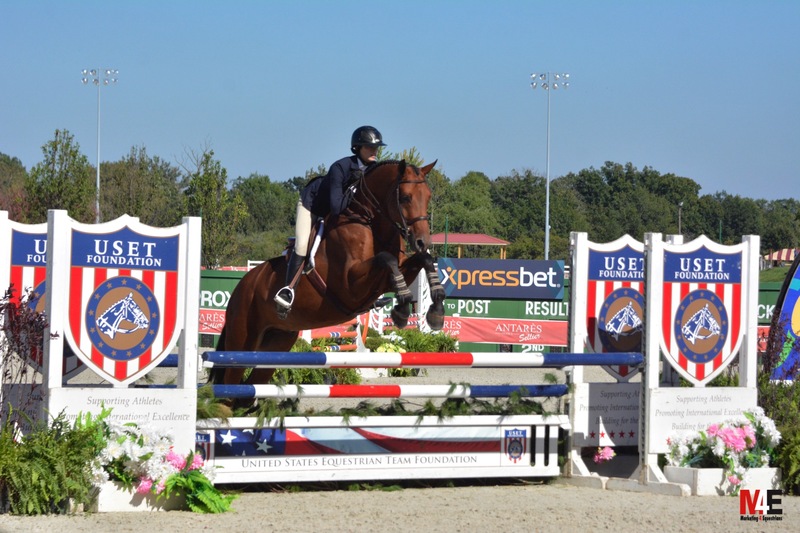 Second place finisher, Aristea Santoro, also out of the Northern Pines camp, clinched the $2,500 M&S Children’s Adult Jumper Final earlier in the day aboard her two-year project, Raquel. 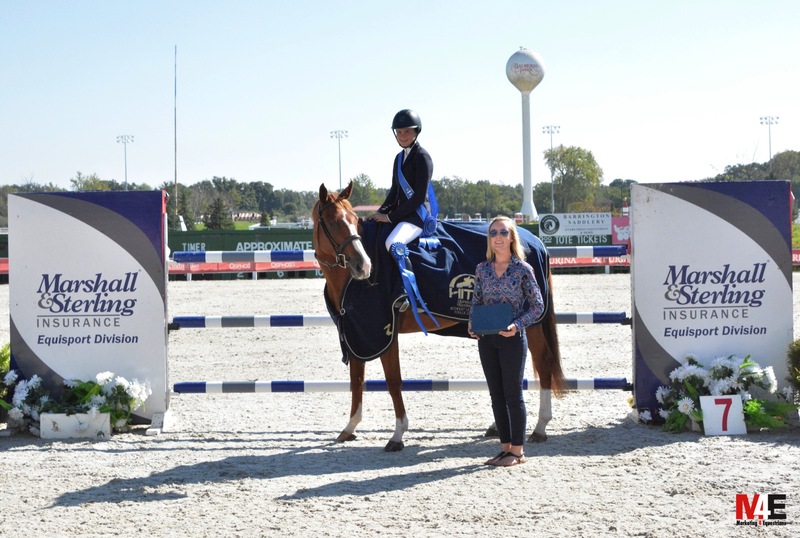 Molly Canfield and Donnalaris took home the second place prize, training with Lorrie Canady and Galway Farm. Aristea Santoro and Raquel head to the winner's circle for the M&S Children's Adult Jumper Final. 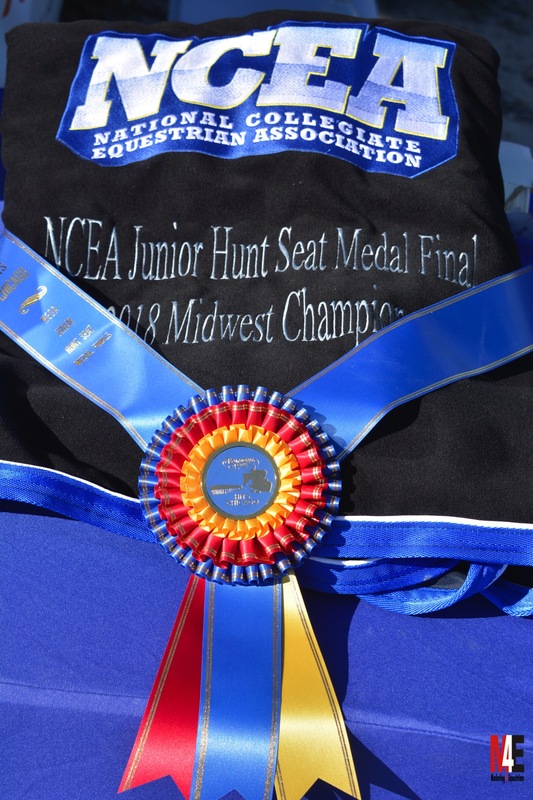 More championship action continues Sunday with the highly coveted Illinois Hunter Jumper Association Medal Finals along with more M&S Finals and Zone 5 Horse of the Year Championships. For complete results and a schedule of events, visit www.hitsshows.com. For livestream, go to www.showhorsetv.com. For more information on the NCEA, visit the website at www.collegiateequestrian.com.